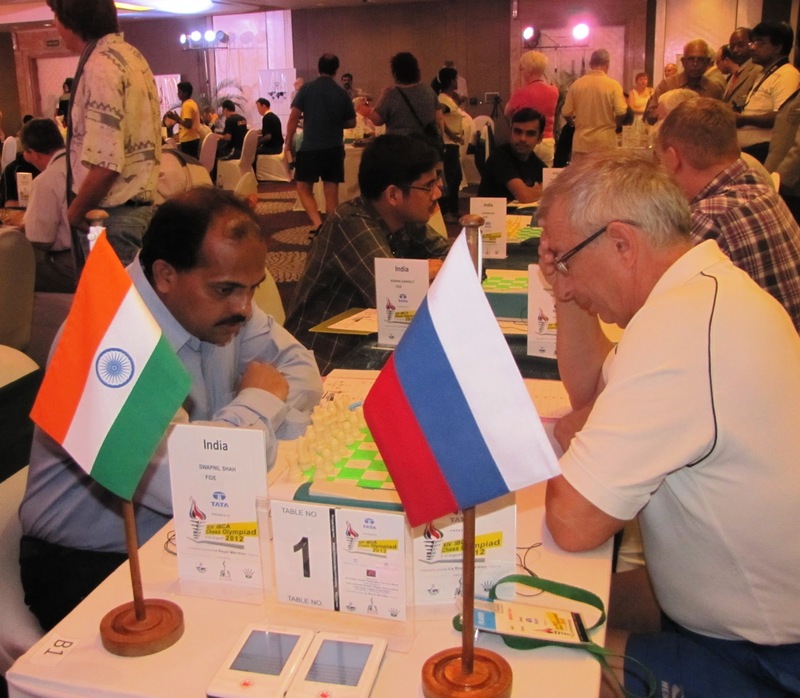 Top seeds Russia beat hosts India “A” in the seventh round of the TATA 14th IBCA Chess Olympiad for the Blind 2012 at Hotel Le Royal Meridien, Chennai on Saturday. Russia now leads the table with 12 match points. Ukraine, with 11 match points, inched to second spot defeating tournament leaders Spain narrowly. With its second successive defeat Spain slid to third position along with Germany at 10 match points. India “A” and Venezuela remained a further point adrift at 9 match points. At the top table, Darpan Inani helped India “A” take off the mark with a quick draw in the third board against Russian Sergei Smirnov. Makwana, the hero of yesterday’s win over Spain, found himself in a minus position in a minor piece ending, after three hours of play. International Master Krylov Sergey rolled his king-side pawns to clinch the issue in favor of Russia. On the top board, Swapnil Shah found himself in a difficult pawn down opposite colored bishop ending. Russian International Master Meshkov Yuri converted the end with skill and gave Russia the crucial point, that took them to the top of the table. At the third table, Germany overcame United Kingdom 2.5 – 1.5, taking the last board through Pohlers Juergen’s efforts. Earlier, the first three boards ended in hard fought draws. The second Indian team, India “B” went down to Bulgaria as Darshan Patel suffered an early loss to Todorov Alexander, putting the hosts behind 0-1. Further losses by Atul Kakade and Shirish Patel sealed the match in favor of Bulgaria, according to a detailed press release. India “A” (9) lost to Russia (12), Spain (10) lost to Ukraine (11), United Kingdom (8) lost to Germany (10), Serbia (9) drew with Slovenia (8), Sweden (7) lost to Venezuela (9), Poland (8) beat Columbia (6), Croatia (6) lost to Kazakhastan (8), Romania (6) drew with Iran (6), India “B” (5) lost to Bulgaria (7), Slovakia (6) beat Denmark (4), Turkey (3) playing Italy (4), The Netherlands (1) lost to South Africa (5).